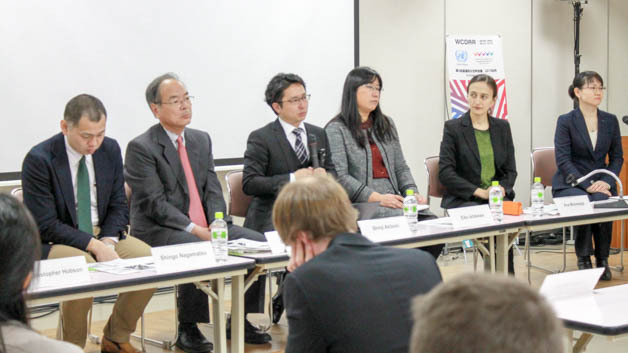 On 16 March 2015, a UNU-IAS panel discussion at the Third UN World Conference on Disaster Risk Reduction explored the challenges of transitioning from immediate disaster response to longer-term recovery, reflecting on lessons from the March 2011 “triple disasters” in Japan. Ana Mosneaga (UNU-IAS) presented findings from UNU-IAS field research in Fukushima, showing how measures developed during the response phase – such as those on evacuation zoning and compensation payments — had long-term consequences for the recovery process. Her presentation emphasized the need for inclusive policy formulation to ensure that recovery plans foster ownership among the affected communities, and to support displaced people in finding workable solutions. Interactive discussion with the audience explored issues including the regulation of nuclear power in Japan, the vulnerability of elderly people to disasters, and the need to provide appropriate relocation options and other sustainable solutions to displacement. The papers presented at this event are available to download as a series of working papers, and the panel presentations are also available in the related files tab. This event was organized as part of the UNU-IAS Fukushima Global Communication Programme, a research initiative examining impacts of the Great East Japan Earthquake, tsunami and nuclear accident of March 11, 2011 on people and society, the challenges of the recovery process in Fukushima, and related issues of risk and information provision.